Common Ford Focus problems | What Car? The Ford Focus has been at the top of the sales charts since its introduction in 1998. There have been three generations, the first was built until 2004, and was available in 1.4-, 1.6-, 1.8- and 2.0-litre petrol guises, or as a 1.8-litre turbodiesel. An automatic gearbox was available on the 1.6 petrol. You could also have your Focus as a five-door hatch, three-door or estate. Between 2004 and 2011, Ford built the second-generation Focus. There was the same choice of petrol engines as the original car, but a more efficient 1.6-litre diesel was added as well as a more powerful 2.0-litre TDCi unit. The 1.6 petrol and diesel could be mated with an auto 'box. Once again, five-door, three-door and estate versions were available, but Ford also introduced the CC coupe-cabriolet in 2006. Since 2011, Ford has been producing the third-generation focus. The engine line-up now consists of a 1.0-litre three-cylinder petrol and 1.6-litre turbocharged petrol in various power outputs. The diesel choice is between a 1.6 TDCi and a 2.0 TDCi engine. Hatchback, coupe and estate versions continue to be available. The 1.6 petrol and 2.0 diesel models are available with an automatic gearbox. We have often recommended buying a Ford Focus, however it has had its fair share of reliability problems and recalls, which potential buyers should be aware of. Ford Focus models built between June 1998 and March 1999 might have alternator problems. There was a possibility that the alternators could develop a short circuit, overheat and cause a fire. Some cars built between September and November 1998 might have had problems with their door latches. They weren't built to specification, with a small plastic part becoming faulty and stopping the door from closing properly. The 1.6 petrol version of the Focus, built between January 1999 and January 2000, could have problems with its engine cutting out. This was caused by a malfunction in the powertrain control module software. Many Ford Focus cars built from March 1998 had problems with the oil filler cap. It had a tendency to work loose, allowing oil to drip onto the exhaust heat shield. Some cars built during March 1999 had a problem with their restraint system and airbags. A problem with the control module sometimes caused inadvertent deployment of the front and side airbags, as well as the seatbelt pre-tensioners. Ford Focus 1.6 petrol versions built between August 1999 and February 2000 could have had problems with their automatic gearboxes. Damage to the crankshaft position sensor often led to engines cutting out. On all models except the ST170 built during March 2002, there were problems reported with the alternator terminals. The B+ terminal could break because it had an incorrect harness, leaving the cable loose. Ford Focus RS models built during December 2002 might have had problems with their brake hoses. They could chafe against the rear wheelarch liners causing a failure. Ford should have fixed this for free, so make sure the work has been carried out. Cars built between July 2004 and February 2005 could have had problems with their fuel return pipes leaking. The pipes were made from material that degraded over time, allowing fuel to seep out. On early second-generation cars built between April 2003 and March 2005, there were issues reported with the wiper motor. Water could enter the motor through the arm spindle, and if it contained salt, could short-circuit it and cause the motor to overheat. This could lead to trim melting around the motor. 1.6 TDCi Focus models built between February and June 2004 might have problems with their engines, causing them to cut out. Misaligned oil feeds between the cylinder heads and camshaft bearings reduced oil flow, causing premature wearing of the camshaft bearings and engine seizure. Cars built between November 2005 and December 2006 could have developed problems with their brake pedals. In particularly cold weather, the pedal could become stiff, as the non-return valve in the pump began to stick. On some Ford Focus CC models it was found that there were issues with the roll-over protection system. Securing bolts holding the system in place were either loose or not fully tight. Therefore the protection would not be fully effective. Ford should have fixed this for free, so make sure the work has been carried out. 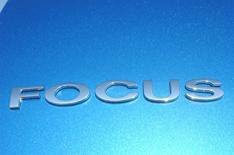 On some Focus 1.6 TDCi estates built between July 2004 and December 2006 there were problems with the cooling fans. Where roads are particularly salty, corrosion could easily occur, reaching as far as the control module. In extreme cases this could cause it to overheat, which could lead to fire. On some Ford Focus models built between February and April 2007 there were problems with the rear hub bolts. They could come loose because they weren't made to the correct design specification. Ford Focus models built between April and May 2008 could have had problems with their power steering. Some of the hoses fitted were not to the required specification. The hoses could degrade and allow hydraulic fluid to seep out, which could either cause the power steering to fail or, in more extreme cases, cause fire when the fluid became hot. Hatchback and estate 1.6 TDCi Ford Focus models, manual and automatic, built between January 2006 and January 2007 may have a risk of fire unless they've had their cooling fans checked. Salty roads could lead to corrosion, overheating and fire if not sorted. On second-generation cars, some owners have reported water leaking into the cabin. Check any sunroof or window seals before you buy. Also look for damp carpet inside, because it could have become mouldy if left untreated. Every one of these issues should have been remedied by Ford for free, so make sure the work has been carried out.